The Clean Power Plan is the nation’s first-ever carbon standard for power plants. Under attack from fossil fuel interests and the Trump administration, it will likely be repealed. We’re fighting back. When power plants burn coal or natural gas, they release carbon dioxide into the atmosphere. Carbon pollution causes global warming—one of the most far-reaching and consequential problems that the world currently faces. Under the Clean Air Act, the Environmental Protection Agency (EPA) is legally obligated to regulate carbon dioxide from major sources in the United States. That’s why, in 2015, the EPA released its first standard aimed at cutting carbon from power plants, known as the “Clean Power Plan.” The power sector is second only to the transportation sector as a source of US carbon emissions. As originally formulated, the Clean Power Plan aimed to cut emissions from the electricity sector by an estimated 32 percent below 2005 levels by 2030—a modest but important first step. Cost-benefit analyses consistently showed a net economic gain from the Clean Power Plan. Unfortunately, opponents of the plan have repeatedly worked to weaken and delay it, first via misleading studies, then through a court challenge, and finally through an executive order and EPA action under the Trump administration. Through these actions, we’ve missed an important opportunity to clean up US power plants—and urgently need to do so now more than ever before. The EPA is still legally responsible for setting power plant carbon standards under the Clean Air Act, consistent with the its statutory responsibility to protect public health and welfare. Together with allies and coalition partners, the Union of Concerned Scientists is actively weighing in on the CPP. Due to the lobbying of opposition groups and the polluter-friendly actions of the Trump administration, the Clean Power Plan as we knew it won’t be implemented anytime soon. At best, it will be replaced by a far weaker standard. The Trump administration is also seeking to cook the books on the costs and benefits of implementing carbon standards. By lowering the social cost of carbon and refusing to include the significant public health co-benefits of cutting soot and smog, the agency is attempting to justify weak standards. What’s more, repealing the Clean Power Plan will not bring back coal-fired power plants, despite the administration’s rhetoric. In reality, coal plants are increasingly uneconomic relative to cleaner sources. Coal miners and coal mining communities deserve real solutions and support, including transition assistance and retraining. We will continue to file comments and participate in court challenges, pressuring the EPA to do its job and implement strong carbon standards for power plants. The consequences of not acting grow by the day. Climate change deniers like former EPA administrator Scott Pruitt have long been propped up by industry money. The Clean Power Plan garnered a record number of supportive comments when it was first proposed. A majority of the American public—including public health, environmental, labor, justice, religious, youth, and business groups—overwhelmingly supported the standard. However, since its inception, the Clean Power Plan has also faced loud, organized, and well-funded opposition. In fact, fossil fuel companies and special interest groups have worked for years to block climate action, concerned that a shift to clean energy will harm their bottom line. Many of these groups take tactics straight from the disinformation playbook—deceiving, misinforming, and buying influence with politicians, all at the expense of public and environmental health. In the case of the Clean Power Plan, coal companies, trade associations, and other interest groups all lobbied to weaken or undermine the EPA’s authority to regulate carbon dioxide. Once in office, President Trump backed their cause, most notably by appointing Scott Pruitt—a known climate denier and oil and gas industry supporter—head of the EPA. Prior to his appointment, Scott Pruitt sued the EPA 14 times as Attorney General of Oklahoma. Though Mr. Pruitt resigned in 2018 amid myriad ethics scandals, the Trump administration’s efforts to undermine climate action will likely continue under Acting EPA Administrator Wheeler. When first released, the Clean Power Plan’s main goal was to cut carbon dioxide emissions from US power plants—a critical objective if we’re to meet any meaningful climate targets. The plan offered options for each state to cut emissions, and determined state emissions reduction targets by estimating the extent to which states could achieve them. Options included: investing in renewable energy, energy efficiency, natural gas, and nuclear power, and shifting away from coal-fired power. The final rule also took steps to limit a rush to natural gas. 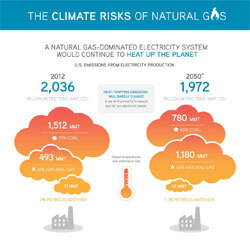 Natural gas isn’t a long-term climate solution, and presents serious economic and environmental risks. Targets differed across states because of each state’s unique mix of electricity-generation resources, and because of technological feasibility, costs, and emissions reduction potentials, all of which vary across the country. States were free to combine any of the options in a flexible manner to meet their targets, and could join together in multi-state or regional compacts to cut costs. In fact, cost-benefit analyses consistently showed a net economic gain from the Clean Power Plan. Unfortunately, given the Trump administration’s actions, the United States remains without a meaningful national framework for cutting power sector emissions, even as clean energy momentum picks up. For decades, the Union of Concerned Scientists has produced independent analysis on energy and climate issues, and worked with our network of supporters to engage and influence the policymaking process—including the Clean Power Plan. A selection of our analyses, white papers, and fact sheets on the Clean Power Plan are listed below. More recent comments submitted to the EPA are available above. Learn how a natural gas-dominated electricity system would continue to heat up the planet.